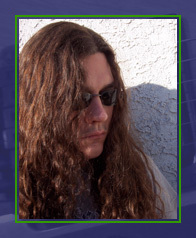 Matt Johnsen : programmer by day, heavy metal enthusiast by night. And also by day. What's left after that? I play guitar in Pharaoh, I write for Metal Maniacs, and I infrequently publish a fanzine called Feast or Famine [link forthcoming]. I have a lovely girlfriend, two cats, and an awful lot of compact discs. I know more yo-yo tricks than you, and I live in southeastern Pennsylvania. As to why you'd care, I can't even begin to imagine. If you're hunting me down to punish me for some heinous crime, I can almost guarantee that it was my brother. I am not a designer, but I know enough designers to know that I haven't made a very pretty site. Such is life. At least it's not offensive to the eyes. The blogging portion of the site is powered by MovableType, and I've gone out of my way to code the entire thing in standards-compliant XHTML and CSS. Thanks to Rob Weychert for turning me on to MovableType and web standards, and for sending me a link to a color theory page that helped me to develop a less repugnant color scheme than the one I originally concocted. The guitar in the header image is a 1990 Jackson custom Randy Rhoads V, with a korinna body and a Brazillain rosewood fingerboard. It is a mighty axe indeed.